Well my break is over. It was a bit longer than what I expected, but I am finally back. There have been birthdays, weddings, and graduations all celebrated on my time off… so needless to say it has been busy, but a fun time. But wait a minute in that time I was off, I also had a cold, which was not fun at all especially for someone who hardly ever has a cold. And then I gave the cold to everyone in the office that I work at, not fun either. Then as always I planned to catch up with my blogging and get ahead of the game, but once again I have come up short. Oh, well such is life. I have to say that I have been struggling a bit on new recipes to post to my blog. I love this blog and I love cooking, I just want to share delicious recipes and I feel that I am stuck a bit right now. If you have any suggestions, I would love to hear about how you stay inspired. 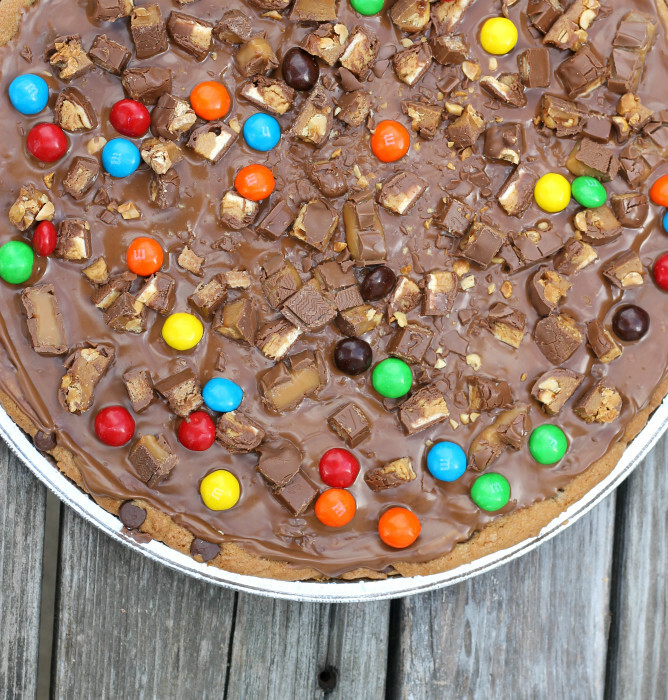 My kids loved this candy topped cookie pizza when they were younger. Not that they are old, but you know when they were school age and we had birthday party sleep overs with their friends. This pizza was always a huge success and my kid’s friends loved it. I haven’t made one of these pizzas for many years. So when my son Jon asked me to make one for his birthday I was quite surprised. He is not a little kid any more, he turned 27 in August. 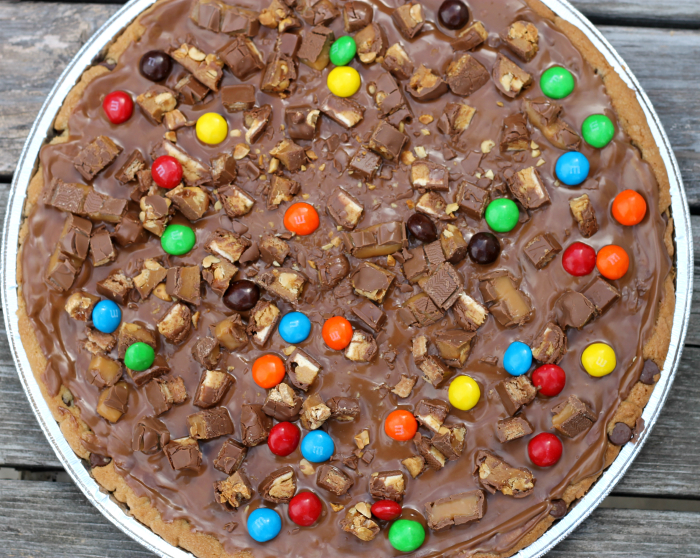 Not that you have to be a kid to love this pizza, but I thought requests for this candy topped cookie pizza were long gone. Well, maybe some day my grandkids will request this and I will make it for them. The request for this cookie pizza was a welcomed one. We had spent the day before the birthday celebration at my niece’s wedding and this was a simple and quick dessert to make. (See I told you that I was busy during my time off.) I love weddings and this one was such a lovely one. The weather was great, the bride and groom were so in love with each other, the food at the wedding was yummy, and it was wrapped up with dancing to fun music. 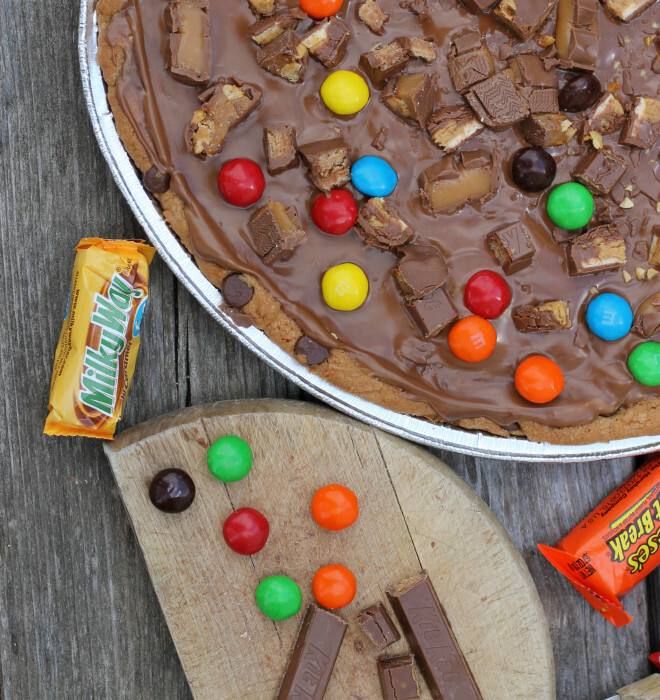 One of the best things about this candy topped cookie pizza, is the fact that you can top it with whatever candies you like. I like to choose a wide variety of candies to top this pizza, but definitely I like to add candy that has peanut butter in it. With an electric mixer beat butter and sugar until light and fluffy. Add egg and mix until well blended. Blend in the vanilla. Sift together the flour, baking soda, and salt. Gradually add the flour mixture mixing until all is blended in. Grease a 12 or 14-inch pizza pan. Place the cookie dough on the pizza pan and pat out evenly. Bake in preheated oven for 15 minutes or until crust is lightly browned. Remove from oven. Sprinkle the chocolate chips over the hot cookie dough. Take the peanut butter and drop small spoonfuls along with the chocolate chips. Allow to melt (if needed pop back in the over for a small amount of time to melt the chocolate chips and peanut butter). Once the chocolate chips and peanut butter is melted spread the two over the crust. Before the chocolate-peanut butter hardens top with your favorite candies. I like to chop candy bars into small pieces. If need press candies lightly into the chocolate-peanut butter to adhere. 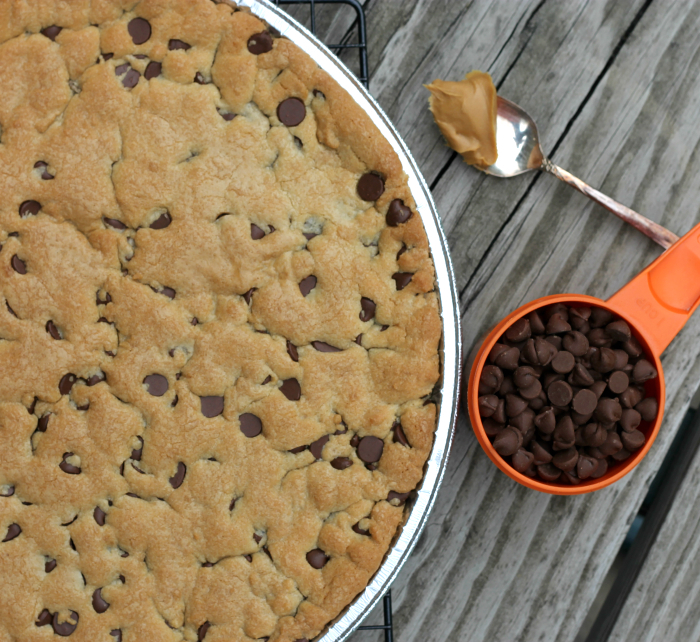 Feel free to use your favorite chocolate chip cookie recipe or purchase a tube of cookie dough for the pizza crust. Im sure my twins would love this. Welcome back. Sorry to hear about the cold. There are not enough ways that I can say how much I LOVE this. First, I love cookie cakes. This would be my hands down dessert anytime. Second, I love candy, so a cookie cake covered in candy…yes please! 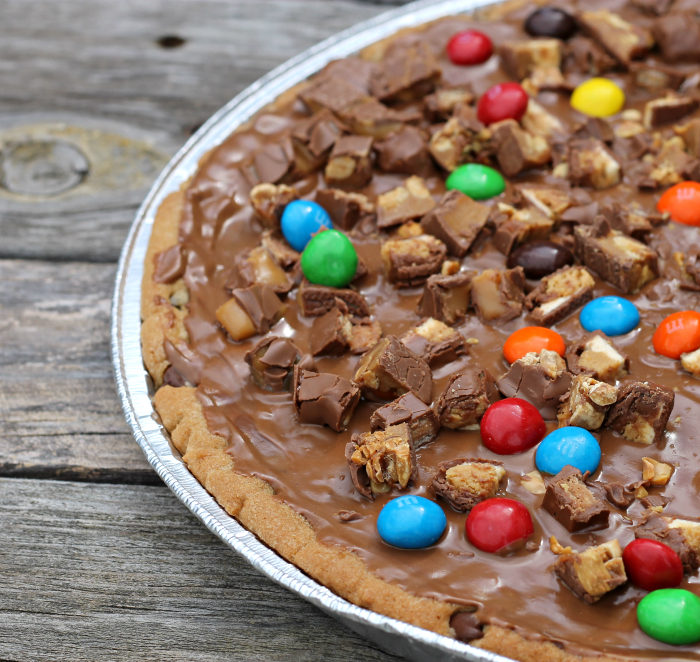 I’ve never made a cookie cake/pizza covered in candy before but I am definitely going to now! Thank you for sharing. This one is definitely pinned and on my bake list! Oh My! now this will be great for a birthday party or what! !